Riverside County operates permanent HHW facilities that offer service on a regular basis and temporary 1-day and 2-day HHW events throughout the year that provide residents of Riverside County a FREE and environmentally safe way to properly dispose or recycle hazardous household waste. Click HERE for the HHW schedule which includes dates, locations and hours. Facilities are closed on designated holidays. Riverside County operates these facilities which only accepts the most common types of HHW (non-contaminated antifreeze, all battery types, used motor oil and oil filters, and paint). Additional items may be accepted on a facility specific basis. Check the table below for a complete list of accepted materials. Burrtec operates the North-West Coachella Valley ABOP and PaintCare Facility located at the Edom Hill Transfer Station. CR&R operates the Anza ABOP and PaintCare Facility located at the Anza Transfer Station. These facilities only accept the most common types of HHW: non-contaminated antifreeze, all battery types, used motor oil and oil filters, and paint. These facilities are not permitted to collect other types of HHW. Please call the phone numbers listed on the flyer to verify operating hours. Burrtec operates the East Coachella ABOP Facility at the Coachella Transfer Station. This facility only accepts the most common types of HHW: non-contaminated antifreeze, all battery types, used motor oil and oil filters, and LATEX paint. This facility is not permitted to collect other types of paint products or HHW. Please call the phone number listed on the flyer to verify operating hours. ONLY residentially generated needles and sharps are accepted at these locations. 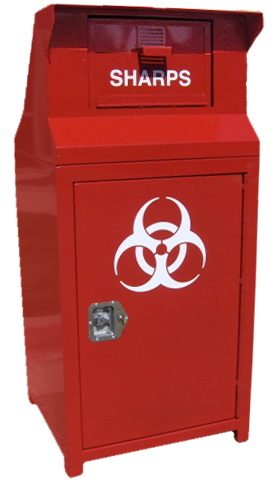 For more information on proper needle and sharps disposal, including the locations of sharps disposal locations, click HERE for the sharps flyer. Additional Hazardous Waste services are available to residents in the following cities. Proof of residency is required for these services. Participating PaintCare locations accept oil based paint and other paint products. For a complete list of PaintCare accepted products, please visit the PaintCare website. Use the site locator tool below to find the location closest to you. If you waste type is not listed, go to the Waste Guide for additional information.